Green chile, garlic, onion and salt make this blend the ideal companion for grilling, seasoning or to bring great Southwestern flavor to any favorite dish! Green Chile Powder, Garlic, Salt, Onion, and Spices. Bottle contains about 55 – 1/4 teaspoon(.9g) servings. Store bottle in a cool, dry place. 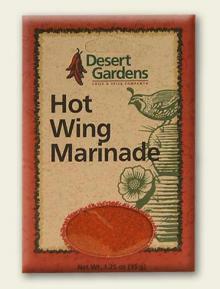 I discovered Desert Gardens seasoning at the Olive pit in central California while on a road trip over 15 years ago and have had it in my kitchen ever since. I mailed away for it by the case. Now I order direct from the source. Try it it s great, I’ve gotten a number of people hooked on it! The Green Chili has a little more of a kick to it than I expected. I thought it would be too mild for me as I LOVE the Jalapeno, but its not – its just great, has a nice heat and allows me to change it up once in a while. I always keep it on my counter. Love this stuff! My kids put it on everything.